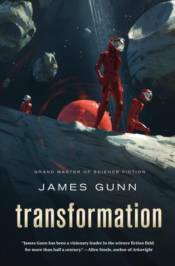 Transformation continues the high-minded space opera by science fiction grandmaster James Gunn which began with Transcendental. Riley and Asha have traveled across the galaxy, found the Transcendental Machine, and been translated into something more than human. They�ve returned to Earth and won over the artificial intelligence which once tried to destroy the Transcendental Machine. Now they must save the fringes of the Federation. Planets at the edge of the Federation have fallen silent. The arrogant Federation bureaucracy grudgingly send Riley and Asha to investigate. They join forces with a planetary A.I., a paranoid Federation watchdog, and a member of a splinter group who vows to destroy the A.I. No one trusts anyone or their motives. They need to find common ground and the answer in order to confront an enemy more ancient and powerful than the Transcendentals.